MHI :: PASADENA :: STAFF :: Nancy Martinez Orellana, M.D. Dr. Nancy Martinez Orellana is board certified Child, Adolescent, and Adult psychiatrist. She completed her undergraduate degree in General Biology at UC San Diego. While there, she was recognized as a biological research scholar, and for her commitment to community service. She developed a volunteer program for college students to assist the uninsured indigenous population in obtaining their prescribed medication(s) through pharmaceutical patient assistance programs. Dr. Martinez Orellana then went on to manage a hospital medical interpreters volunteer program. She remains an advocate for access to healthcare, decreasing mental health stigma, and the application of Culturally and Linguistically Appropriate Services. 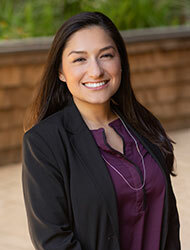 Dr. Martinez Orellana received her medical degree from the Keck School of Medicine of USC. Throughout her years as a medical student, she held leadership positions at a local and regional level. She completed her General Psychiatry Residency Program at the UCLA Sepulveda program, a multi-site program with training at The Resnick Neuropsychiatric Hospital UCLA, VA facilities (West LA Healthcare Center, North Hills Clinic), and UCLA Olive View Medical Center. Dr. Martinez Orellana pursued specialty training by returning to LAC+USC for the Child and Adolescent Psychiatry Fellowship. As a fellow, she completed rotations at Children’s Hospital Los Angeles (CHLA), where she also completed elective research on psychopharmacologic treatment of medically ill children with psychiatric symptoms. Dr. Martinez Orellana is committed to treating the whole person, not simply their medical problems. She prides herself in taking time to understand how biological, psychological, experiential, and circumstantial factors interconnect for each of her patients. She is happy to incorporate the ResWell program in treatment planning at MHI-Pasadena because she recognizes that building mental and physical resilience fosters personal stability and optimal wellness.